Victorian England - a time of historic significance, as the world was poised expectantly for the coming wonders and terrors of the new century. Amid this atmosphere of anticipation and intrigue, one man emerged as a beacon of logic and cold, calculating reason in an unsettling time: R. Sherlock Holmes, consulting detective, and his trusted friend and chronicler, Dr. John H. Watson. 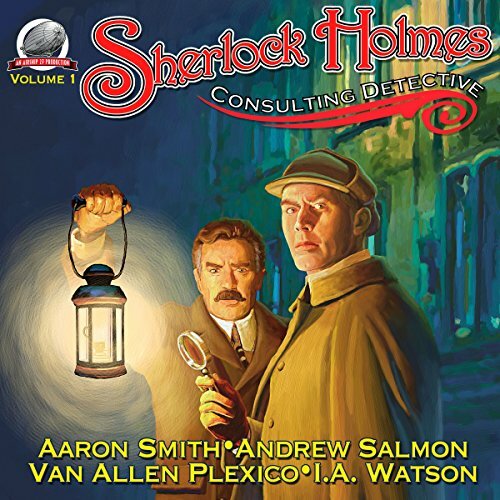 Writers Aaron Smith, Andrew Salmon, Van Allen Plexico, and Ian Watson have set forth exciting new mysteries done in the traditional style of the original Holmes stories, as written by his creator, Sir Arthur Conan Doyle. There are no space aliens or howling werewolves here, simply good, old-fashioned whodunits. So arm yourself for danger and all manner of villainy, as once again, the game is afoot! What did you love best about Sherlock Holmes - Consulting Detective, Volume 1? The Airship 27 Consulting Detective series is top notch and perfectly captures the feel of the original Conan Doyle tales. George Kuch is a fantastic reader. Four new Holmes story. What's not to love? The locked room mystery at 221 B Baker St. The confession of the naval captain in the first tale. One of the finest audio books I've ever enjoyed listening to. Narrator voice was different but ok. I opine we needed more of a UK accent. Stories and explanations were detailed and interesting but would rather have the explanations included in the same chapters as opposed separate chapters. I guess more stories would have been more fun! Stories started a bit slow but great as we got into the book.